Justine Kim speaks during Wednesday’s ASG Senate. The SESP sophomore was later elected ASG parliamentarian. 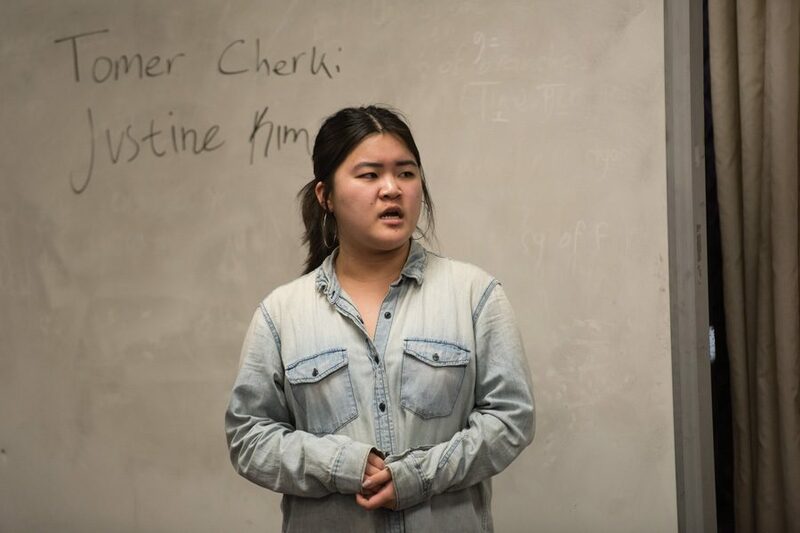 Associated Student Government Senate elected SESP sophomore Justine Kim as parliamentarian Wednesday, a week after voting no confidence on two other candidates. Kim, who was sworn in shortly after being elected, previously served as a senator for the Korean American Student Association, where she also serves as the group’s outreach chair. “More than anything, I want to create a culture where senators want to be here and want to be here for their constituents,” she said. Kim defeated Weinberg sophomore Tomer Cherki by a vote of 16-12-1. Cherki, who was a senator during the 2015-16 academic year, wrote the code of ethics at the end of the ASG code and also served on the Rules Committee last year. During the parliamentarian election, Cherki said he would hold office hours to help senators draft legislation and would create an abridged version of the ASG code. Kim will succeed Weinberg junior Daniella Lumpkin, who was elected speaker of the senate last week and was sworn in Wednesday. Lumpkin is succeeding Weinberg junior Nehaarika Mulukutla, who is currently running unopposed for ASG president. In the wake of former IFC senator Mike Seethaler’s walkout that postponed a vote on a sexual assault accountability resolution, Senate saw a one-week uptick in attendance. But during the two sessions of Spring Quarter, Senate has operated close to the 25 senators needed for quorum. The parliamentarian has the ability to hold senators accountable for continued absences from Senate. Speaking during the election process, Mulukutla stressed the importance of the parliamentarian position. “It is really important to recognize that the parliamentarian needs to have the capacity to do the work that they need to do and be able to think about legislation and rules,” she said. Kim will be the third parliamentarian in 2017, following Medill junior Shelby Reitman’s resignation in February and Lumpkin’s succession of Reitman for the remainder of her term. Before Wednesday’s election, Kim said enforcing accountability would be her main focus. Senate also passed amendments to the A-status code. Co-vice president for student life Ben Powell introduced changes that would split his position into two new ones –– vice president for health and wellness and vice president for housing, dining and facilities. The proposed change will be voted on next week. It was the last full Senate for ASG President Christina Cilento and executive vice president Macs Vinson. The election for the next president and executive vice president is scheduled for Thursday.